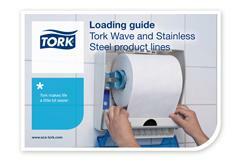 Ease of use for end-users drives Tork’s development of dispensers for soap, towels and wipes for specific locations and requirements. However, this diversity also means that hygiene workers face the problem of refilling a whole series of different dispenser types. This can be particularly problematic for organizations due to the high turnover and cultural diversity of workers in the hygiene sector. To eliminate training requirements and loss of productivity Tork developed with Centigrade a comprehensive and user-friendly Refill Guide explaining step-by-step how to refill each dispenser. 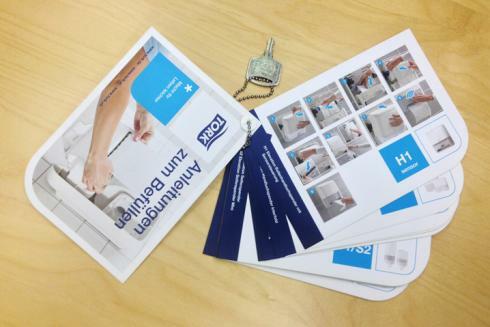 The guide was designed using easy to follow visual instructions to be as accessible as possible. And to ensure that it was always to hand it included the necessary keys to open all Tork dispensers on an integrated keychain. It was produced in hard wearing, wipe-clean plastic (of course) making it an all-round essential tool for hygiene workers.